“Our findings point the way to the development of new therapeutic treatment for muscular diseases such as muscular dystrophy, sarcopenia, and muscle wasting conditions resulting from extended hospital stays and surgeries,” said Dr. Michael Rudnicki. Scientists at the Ottawa Hospital Research Institute (OHRI) and the University of Ottawa have discovered a powerful new way to stimulate muscle regeneration, paving the way for new treatments for debilitating conditions such as muscular dystrophy. The research shows for the first time that a protein called Wnt7a increases the number of stem cells in muscle tissue, leading to accelerated growth and repair of skeletal muscle. “This discovery shows us that by targeting stem cells to boost their numbers, we can improve the body’s ability to repair muscle tissue,” said senior author Dr. Michael Rudnicki (pictured). 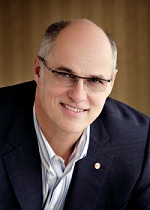 Dr. Rudnicki is the Scientific Director of Canada’s Stem Cell Network and a Senior Scientist at OHRI and Director of OHRI’s Sprott Centre for Stem Cell Research, as well as a Professor of Medicine at the University of Ottawa. Stem cells give rise to every tissue and organ in the body. Satellite stem cells are specialized muscle stem cells that live in adult skeletal muscle tissue and have the ability to both replicate and differentiate into various types of muscle cells. Dr. Rudnicki’s team found that the Wnt7a protein, when introduced into mouse muscle tissue, significantly increased the population of these satellite stem cells and fueled the regeneration process, creating bigger and stronger muscles. Muscle tissue mass was increased by nearly 20 per cent in the study. “Our findings point the way to the development of new therapeutic treatment for muscular diseases such as muscular dystrophy, sarcopenia, and muscle wasting conditions resulting from extended hospital stays and surgeries,” said Dr. Rudnicki.